Gulf Front Inlet Beach Vacation Home 'Bull and Bear' with Amazing Gulf Views Plus Carriage House! 'Blue Pointe of View' Seacrest Beach Vacation Rental House + FREE BIKES! 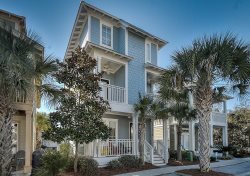 Gulf front, with amazing views of the Emerald Coast waters and just steps from your door to the white sand beaches, Bull & Bear is the perfect home for your next 30A Escape! The main house and carriage house of this home offers 5 bedrooms and 4.5 baths with sleeping for 15 people. Upon entering the main house, you will enjoy the open concept living, dining, and kitchen areas. With updated decor and plenty of space for everyone, this is a great spot for gathering after a sun-filled, fun-filled beach day! The gulf views are the true star of this space though. Off the living area is the king master bedroom with en-suite and private access to the deck. The master suite has great views of the gulf! On the second level of the home, you will find yourself gathered together with friends and loved ones creating memories of a lifetime. This space offers 3 bedrooms, 2 baths, a sitting area and a media area. At the top of the stairs is the sitting area which is a great space to play games. Or step out onto the balcony and watch the sunset over the Gulf of Mexico. Once the sun has set, catch a movie in the media area with small kitchenette. The guest rooms on this level will not disappoint. The king guest room and the queen guest room share a bath. There is also a bunk room on this floor. With 2 sets of bunks with trundles, this room sleeps up to 7- the perfect spot for the kids or teens! The carriage house, located over the 2 car garage, is an added bonus. With it's own living area, kitchenette, king bedroom and full bath, this is a great location for some additional guests. If you can pull yourself away from the beach, nearby Rosemary, Seacrest, and Alys Beaches offer an array of casual and fine dining, all just a short walk or bike ride away. Look no further, Bull & Bear is the perfect gulf front beach home for your next beach vacation! 3) New Reservations Only- 6 bikes are included in the rental. To utilize, waiver must be signed and received before code provided. Please contact Saxon Smith with Bikes4U at 850.399.1230 with any bike questions.